OpenChain has reached several important milestones during the last month. The first is a new release of the Specification (see below) but no less important are the strides being seen in adoption, reference material contributions, case studies and local work teams or workshops. It provides a strong start to our quarter with thanks, as always, due to our vibrant community. The OpenChain Specification version 1.2 was released on the 19th of April at the Legal and Licensing Workshop in Barcelona. This document presents a refined, easier to understand and easier to translate format. Our goal is to open our community to wider participation and adoption. Specification version 1.2 is the result of contributions of more than 150 people over the past three years. Congratulations and a big thanks to all those who contributed! Each and every contribution, whether or not it resulted in an addition, modification or debate, led to a better specification. The OpenChain Project is delighted to welcome NodeWeaver as the latest organization with an OpenChain conformant program. NodeWeaver is a zero-management hyperconverged infrastructure – that integrates storage, networking and virtualization in a single system. It is built using the same principles of large scale systems used by Google and Amazon, making them available to small and medium enterprises. But there is more! As mentioned in our last newsletter, we have been working with the British National Health Service and their partners on both conformance and case studies. We are honored to be able to formally announce the first fruits of this collaboration. We have welcomed AB EHR as an organization with an OpenChain Conformant program, an important step towards practical adoption by NHS providers charged with running technical projects, in this case the Code4Health initiative. “We have been supporting Code4Health for a number of years to manage their open source supply chain. The OpenChain Specification has enabled us to validate the processes meet industry best practice and that the solutions being promoted to NHS are best of breed and this can be transparently demonstrated.” Martin Callinan, Director Source Code Control Ltd. 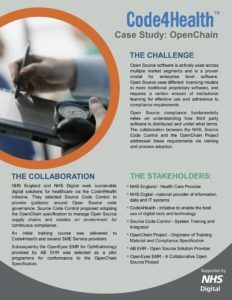 The OpenChain Project is delighted to announce the release of our first case study, a collaboration with NHS England, NHS Digital and AB EHR. This case study offers an insight into how and why the British National Health Service has decided to use the OpenChain Specification as a baseline for effective compliance across its digital projects. Our first case study is centered around adoption by the service provider AB EHR for the code4health project. This marks the first step in a broader deployment plan across multiple projects and providers in the coming months and years. The OpenChain Project was featured at numerous events across the globe in late March and throughout April. The first event was in partnership with Moorcrofts in the UK with an OpenChain session at a BCS event in London on the 22nd of March. On the same day Software Compliance Academy highlighted the OpenChain Project, curriculum, training and specification at an event hosted on the 22nd March by ZVEI, one of the most important manufacturers’ associations in Germany. We were then featured in a keynote on OpenChain at Linaro Connect in Hong Kong (also on the 22nd March!). The OpenChain Project was featured at the first Asian Legal Network meeting of 2018 in Tokyo on the 6th of April. This was followed by an Asian Legal Network event in Seoul on the 12th of April. We had a substantial presence at the Legal and Licensing Workshop Barcelona between the 18th and 20th of April. Which overlapped with a simultaneous third meeting of the OpenChain Japan Work Group at the Panasonic headquarters in Osaka on the 19th of April, attended by representatives from 15 companies. Internationalization efforts are being prepared to translate the new OpenChain Specification into our key target languages (Japanese, Chinese, Korean and German). Activity is also underway to provide outcomes from the Japan Work Group sessions to the wider community. Of particular note are several case studies from companies like Panasonic to discuss their experiences and reasons for engagement. You can expect additional announcements regarding conformant organizations, reference materials and translations in the coming month. The process for developing the OpenChain Specification 1.3 will also get underway. All contributions, suggestions and comments are always welcome.